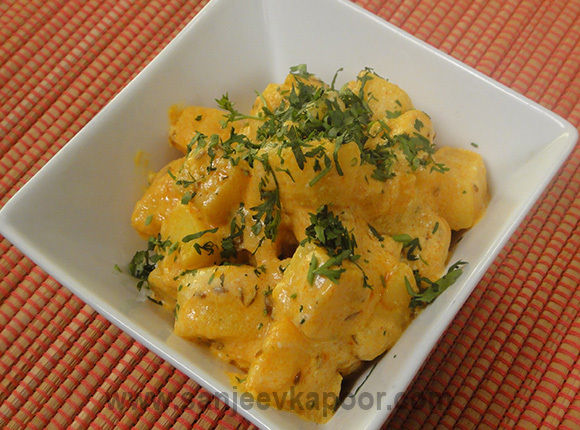 Boiled potato cubes cooked with simple masalas, mixed with yogurt and served. Put potatoes in a bowl, add salt, chilli powder and turmeric powder and mix well. Set aside for four to five minutes. Heat oil in a non-stick pan. Add cumin seeds and when they begin to change colour, add asafoetida and green chillies and sauté for one minute. Add potatoes and mix. Add two cups of water and mix. Add sugar, salt and lemon juice and mix. Cover and simmer for five to six minutes. Set aside to cool slightly. Add yogurt and mix.